Just before ringing in the new year, I thought I'd look back at a few of my favourite recipes I blogged about this year. I look forward to sharing many more food stories with you in the year ahead and thank you for all your comments and questions - they make this blog worth writing! It's hard to believe I started writing this little blog back in 2007 -- when I didn't yet know just how much food would become integral to my professional career. What started as a simple passion for making food at home and sharing it with like-minded readers has turned into my full-time occupation. Since starting my job as a Food Specialist for Canadian Living magazine, there are very little days where talking about a new way to use an ingredient or thinking about a new dish to create isn't on my mind.. and I wouldn't have it any other way. 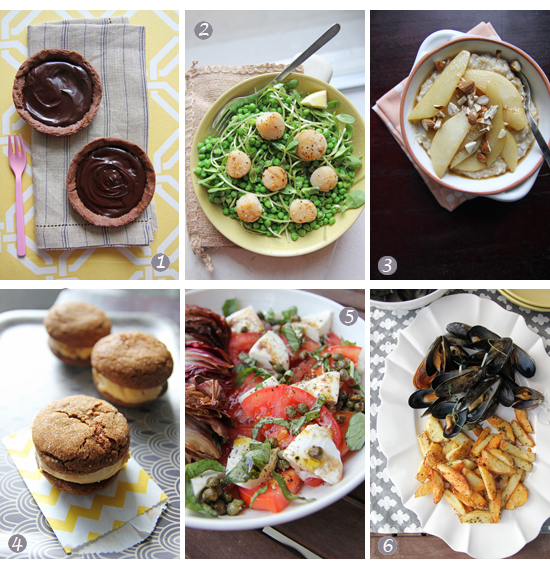 And now for the recipes, here is 2012's top 6! All the dishes look delicious! Can see why there are the Best of 2012! I'm totally craving those mussels for breakfast, lol. Wishing you a very happy new year! Thanks for the tasty round up. Thanks for stopping by, I'm so glad you liked the dish... coming from you that's high praise indeed. Have a great New Year –– keep those wonderful pictures coming! Those chocolate tarts look aMAZing, as does everything else! What a great year! Chocolate tarts are always a great favourite, as are scallops. Congratulations of where you are in your career. Happy New year. Chic & Gorgeous Treats: Thank you! I look forward to seeing your new posts as well! What lovely recipes! I particularly love those cookie sandwiches. Look forward to following you in 2013! Holiday Treats and a Giveaway!